"Microtomographic quantifications of dissolution/precipitation processes at the pore scale and reactive simulation of the porosity-permeability relationship"
Samples from the autoclave experiments of the according subprojects will be scanned in high resolution at the µXCT laboratory (JGU Mainz). As the next step, the samples have to prepared digitally (3D image filter, pattern recognition) and segmented into phases (mineral phases, pore space) implicating a high effort. Based on the segmented data, effective petrophysical parameters are simulated. This approach is according to the „Digital Rock Physics“ (DRP-) concept (see figure). From left to right: Comparison of flow field changes affected by pore space alteration during autoclave-experiments. Segmented data from samples before and after the autoclave experiments and effective parameters derived from these are quantitatively compared with each other. Thus, quantitative changes of reservoir-specific and pore scale parameters (especially porosity/permeability) can be obtained and documented. These changes are caused by alterations of mineral phases and the development of pore cements. Based on DRP data, REV analyzes are performed, while being necessary for upscaling. Semivariograms of pores and flow fields (local permeabilities) show statistical heterogeneities within the structure and, thus, a determination of REVs is enabled. (1) Flow field of the respective precipitation-structure. 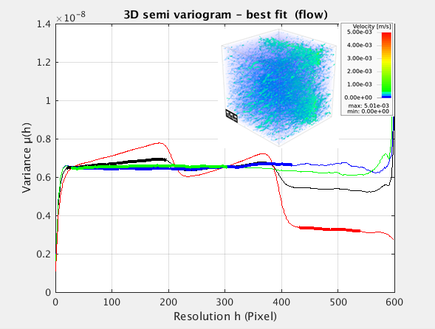 (2) Anisotropic semi-variogram of the flow field variance after precipitation-simulations in x-(green), y-(blue), z-(red) direction. This figure shows the flow field variance of a pore geometry including a SrSO4 precipitate front being aligned perpendicular to the Z-axis. The impact of that precipitation zone is clearly visible in (1) the flow field and (2) in its respective semi variogram. A slope dependent algorithm detects the largest REV-domain automatically in each direction (highlighted lines). One main object of this subproject is the simulation of the dynamic relationship between porosity and permeability in reservoir rocks (sample material) developing due to alteration processes (autoclave experiments). For that purpose, a model workflow combining numerical solvers is continuously developed and adjusted at the University of Mainz. The effective software code GeoDict (Math2Market GmbH, Germany) simulating trajectories of virtual particles is coupled to the geochemical calculation code IPhreeqc (USGS) based on the operator splitting approach and the Lagrangian transport method. Alteration processes are simulated in segmented data at a high spatial and temporal resolution. Thus, having implemented initial conditions of the autoclave experiments (fluid composition, mineral phases, P/T conditions), they will be simulated numerically. This 3D visualization shows the dissolution of calcite grains (grey) due to inflow of acidic water (left face to right face). Chloride ions act as a conservative tracer for the inflowing solution. They are shown in colours from blue to red (0 - 1e-3 mol / L). This animation shows results of a 3D reactive transport simulation, which is kinetically controlled dissolution of calcite grains. These diagrams show representative 2D slices and the according 3D porosity/permeability relationship. The upper rows are visualized from pore fluid datasets of continuously increasing time steps.